MORMONS PAID BY US GOVERMENT FOR CHILD CARE! One of the most outrageous facts of the aftermath of this tragedy was the fact that the US Government paid Mormon Jacob Hamblin $600.50 for the care of Sarah, Rebecca and Louisa Dunlap from Sept. 10, 1857-April 17, 1859. Hamblin was paid $318.00 for expenses he incurred in hunting one of the children who survived the massacre. From Dec. 1, 1858 to June 30, 1859 another $350.00 and from Aug. 1, 1858-April 18, 1859, $1,693.20 was paid him for board, clothing and schooling for children saved from the massacre. $2,961.78 was Hamblin's take for caring for these children, killed by his Mormon brothers and stole their worldly goods. It was Captain James Lynch, U.S. Army who finally collected the children and took them to Ft. Leavenworth, Kansas where they were met by Senator Mitchell and returned to relatives in Arkansas. Senator Mitchell had lost three sons in the massacre. It was undoubtedly the senator who kept the heat on that led to the rescue of the children and bringing to justice at least one of the guilty, John D. Lee. 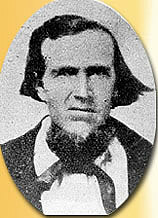 Captain James Lynch, the rescuer of the children, expedited the recovery of the surviving children by pulling a gun on Jacob Hamblin and threatening to "send him to Purgatory" if he didn't stop lying about the whereabouts of the children. Finally in 1877, Lee was executed for his part in the affair. Lee was definitely at the massacre and he is credited with killing Rachel and Ruth Dunlap. Rebecca (7 at time of the massacre), after she lived in Woodberry, Arkansas, often told of seeing Lee wash the Indian paint off his face after the massacre.